A term (short for terminal) is a standardised data structure in ComputerCraft. It describes anything that can be drawn to, e.g. the screen of a Computer, a Window, or an Advanced Monitor. All term objects must implement the same functions, but can also add their own. These functions are shared by all term objects. This article is incomplete. This is because this page is being written by Khuxkm. Please help to improve it, or discuss the issue on the talk page. Writes text at the current cursor position in the current term, using foreground colors from textColour (a string containing colors as used in images loadable by paintutils functions) and background colors from backgroundColour (same as textColour). All characters represent a single hexadecimal digit which is then plugged into the equation c=2^(h-1) where h is the hexadecimal plugged in and c is a the equivalent color that would be plugged into term.setTextColor. Prints "Hello world!" in 11-color text. Clears the terminal object using the current background colour. The term's cursor position, text colour and background colour states remain unchanged. Clears the current term with a red background colour. Output The screen is cleared and filled with red. Returns the current X and Y position of the cursor of the terminal object. Prints the cursor position of the current term. Returns the RGB values (0–1) of the specified palette colour of the terminal object. Prints the decimal RGB value of the colour red in the current term's palette. Prints the decimal RGB value of the current term's text colour. Returns the width and height (in characters) of the terminal object. Prints the width and height of the current term. Returns the numerical value of the current text colour of the terminal object. Prints the numerical value of the current term's text colour. Gets the current term's text colour, and then matches it against a lookup table to get its name. Moves everything on the screen up distance pixels. ExampleMoves "Hello World!" up 3 pixels, and then prints "This text was printed 3 pixels below 'Hello World!" 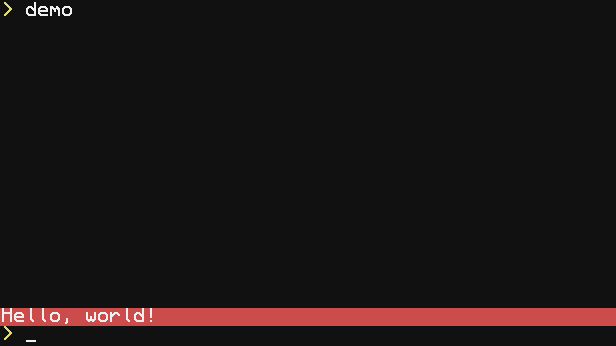 Sets the background colour of the terminal object. All text written after calling this function will have this background colour, until it is changed again. Prints "Hello, world!" with a green background. Sets whether or not a blinking cursor should appear at the current cursor pos in the terminal object. When the cursor moves, the blinking cursor will move too, and it will continue to blink until it is manually turned off. Lets the user press enter to toggle whether or not the cursor is blinking. blinking = not blinking -- Toggle blinking state. Sets the X and Y position of the cursor on the terminal object. The next write on this terminal object will begin from the new cursor position. Clears the bottom line of the screen with a red colour, and prints "Hello, world!" in white text. Writes text at the current cursor position in the current term. Unlike print, this function does not automatically move to the next line after writing. Additionally, unlike write and print, it does not perform any text wrapping. Most of these events are shared by all term objects, but some, such as mouse events, are available exclusively for Advanced Interfaces. Occurs every time the user typed a letter. Ask a question that can be answered based on typing a character. Occurs every time the user presses down a key or when a key is being repeated because it's being held down. Showing what key the user is interacting with and telling if it's being held down. Occurs every time the user releases a previously pressed down key. Shows what key the player released. Occurs every time a mouse button is pressed. Note: This event is only called on advanced terms, such as an Advanced Computer, Advanced Pocket Computer or Neural Interface. Prints the mouse coordinates and button name every time a mouse button is pressed. Occurs every time the mouse moves to a different position while a mouse button is held down (e.g. left click dragging). It will always be called after a mouse_click event. Note: This event is only called on advanced terms, such as an Advanced Computer, Advanced Pocket Computer or Neural Interface. Prints the mouse coordinates every time the mouse is dragged on the screen. Occurs every time a mousewheel scrolls. Note: This event is only called on advanced terms, such as an Advanced Computer, Advanced Pocket Computer or Neural Interface. direction : number The direction that was being scrolled in. -1 is up and 1 is down. Prints the scroll direction and mouse coordinates every time the user scrolled. Occurs every time a mouse button is released after it was pressed down. Note: This event is only called on advanced terms, such as an Advanced Computer, Advanced Pocket Computer or Neural Interface. Prints the mouse coordinates and button name every time a mouse button is released. Printing everything the user pastes. Saves everything that the user pastes to a file. Occurs every time the term resizes. Notifies the user when the term has been resized.